Enthusiastic volunteers are set to clean up Renfrewshire as they take part in the Spotless September Challenge, the latest event of the Team Up to Clean Up campaign. Taking place over the weekend of 28-30 September, hundreds of community volunteers, schoolkids, businesses and council staff are expected to take part in a series of litter picks. Every town and village in Renfrewshire is being challenged to host a clean-up in their area, whether that’s through a lone litter picker or every class in a school taking part. The challenge will build on success of the Big Spring Clean, where more than 1000 volunteers turned out over one weekend in April to collect 500 bags of rubbish from the streets of Renfrewshire. Lisa Chalmers, Gleniffer High School Head Teacher, said: “Our pupils are delighted to take part in the Spotless September Challenge and have been actively trying to keep our community clean through regular litter picks. 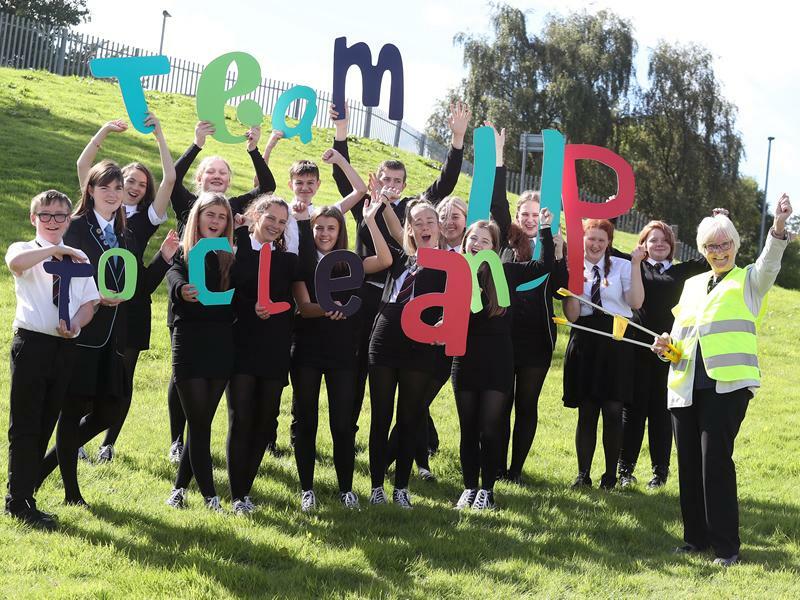 “Young people across the school have committed to working together to endorse the ‘Team Up to Clean Up’ message and are aware of the importance of this in our local community. Since the campaign was launched in October last year, more than 150 litter picks have taken place by inspired local volunteers. To celebrate the success of the campaign, and the weekend of the Challenge, a special thank you event is set to take place at Paisley Town Hall on Sunday 30 September - with volunteers invited for food and networking with like-minded people from across Renfrewshire. Councillor Cathy McEwan, Convener of Renfrewshire Council’s Infrastructure, Land and Environment Policy Board, said: “The Big Spring Clean was a fantastic success and showed the level of support which the community has for the campaign. “We’re working hard to make our communities brighter and more attractive places to live, and this can only happen if people come on board and make sure they do their bit to make a difference. “We have many fantastic community groups carrying out inspirational work and they’re always looking for like-minded people to join them. The Team Up to Clean Up campaign has been allocated £2.5million across five years to make a real difference to the cleanliness of the streets in Renfrewshire and improve the local environment. As well as the support from local communities, an enhanced programme of operational activity is underway to clean gullies, sweep the roads and repair the roads infrastructure to ensure the campaign is a joint approach between the council and its residents. If you’re keen to take part in the Spotless September Challenge, call 0300 300 1375, email wardens.es@renfrewshire.gov.uk or visit www.renfrewshire.gov.uk/teamuptocleanup.